Corey Simms of ‘Teen Mom 2’ originally filed for primary custody of the 4 year old twins Ali and Aleeah, but instead he and Leah will be sharing responsibilities more evenly. According to Corey’s lawyer Rusty Webb of The Webb Law Centre in Charleston who spoke with RadarOnline Corey will have the girls 3 nights per week while Leah will have them 4 nights per week. As far as the medical responsibilities of Aliannah who has a rare form of muscular dystrophy, Webb says “there will be a shared responsibility to get her to and from appointments,.. both parents will be present for her therapy visits.” This way Corey can make sure that Ali is attending all of her scheduled visits, which he was concerned about after receiving letters threatening to cancel Ali’s treatment due to missed appointments. Another source that spoke with the site says that Leah is “upset” with the new agreement because she didn’t want to lose any time with the twins. 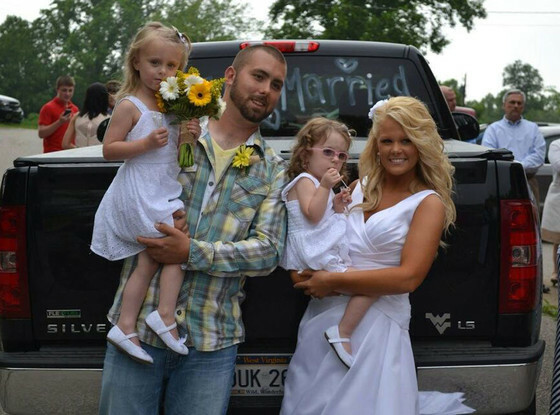 Leah also stated on ‘Teen Mom 2’ that she wanted to be in charge of Ali’s medical coverage and decisions. Ali and Aleeah turn 5 years old on December 16th and will have a 2 separate Birthday bashes, one with Leah and one with Corey. Previous Previous post: PHOTO! Check Out Kailyn Lowry’s Christmas Tree! It is fair for them both to have time with the twins n responsibility for medical bills n for both of them to be there. I’m glad it’s all sorted n the twins will have both parents in there lives. Well thats what you get when you get the courts involved! Im just thankful the twins even have 4 parents involved!! It is not fair Cory did not heaven doubt her to have the chair like the doc. Stayed she needed.